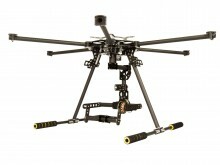 The set AJ6-800 Advanced AirJib consists of the copter AF6-800 in combination with the gimbal CM-M in its 3-axes version. This configuration is best suited for professional aerial photography with high quality demands. With the Advanced AirJib and an appropriate camera at a minimum take-off weight (under 5kg) you will be able to record footage suitable for TV and cinema. The gimbal used is of the CM-M-G3D make, which is a 3-axes gimbal with two motors for the pitch axis (double pitch drive). The camera mount is ideal for cameras such as the Sony A7 or the Panasonic Lumix GH4. Since the gimbal can be rotated completely independently around the copter's main axis by 360° we have fitted the set with the landing gear AF6-800-LGG which is permanently attached and thereby follows exactly the gimbal's movements. The damping system used is our AF6-800-DPG. Since no landing gear is attached to the copter itself there is room for the battery holders AF6-800-BHG to be installed directly on the lower centerplate. In the configuration of our Advanced AirJib both copter and gimbal are two completely separate and independent systems. Therefore we recommend it for operation by two people with one taking over the role of the pilot and the other that of the cameraman. The Advanced AirJib consists of the following components. Basecam Alexmos brushless gimbal electronics is not included! 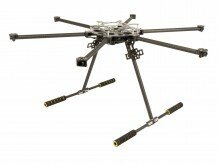 The set AJ6-800 Advanced AirJib consists of the copter AF6-800 in combinat.. 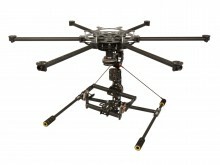 The set AJ6-800 Basic AirJib consists of the copter AF6-800 in combination with the CM-M gimbal in its 2-axes version. This configuration is very well suited for beginners just starting to explore the world of aerial photography. For this set we decided on the simplest version CM-M-G2S of our gimbal, which is a 2-axes gimbal with a motor for the pitch axis (single pitch drive). This camera mount is ideal for lightweight cameras such as a Sony Nex5/7 or a Blackmagic Pocket. Since the gimbal has only two axes the copter has been fitted with the permanently attached landing gear AF6-800-LGC. The damping system used is our AF6-800-DPC. One advantage to a copter with a 2-axes gimbal is that its operation ordinarily only requires one person. However, it is recommended that the pilot has the option of swiveling the camera vertically up- or downwards via his own channel. An upgrade to the AJ6-800 Advanced AirJib set is possible at any time. The Basic AirJib consists of the following components. The set AJ6-800 Basic AirJib consists of the copter AF6-800 in combination..
As part of this set we offer a copter that already possesses all of the components in its initial configuration that are necessary for a stable support system to transport various payloads. The copter can be expanded at any time to, in conjunction with a gimbal of the CM-M make, later be operated as an AirJib (AJ6-800-BAJ, AJ6-800-AAJ). We recommend this set if you would first like to familiarize yourself with the AF6-800 copter and then decide at a later time which version of the CM-M gimbal is most suitable to your needs. The basic air frame comes with the damping system AF6-800-DPC and the mounting frame AF6-800-MFR. By employing the optionally available pipe clamps GPI-BC12 and a suitable adapter you can attach for example a gimbal made by a third party provider to it. Alternatively you can also install the universal mounting plate AF6-800-UMP on the damping system, which is not included in the delivery contents. The set consists of the following components. As part of this set we offer a copter that already possesses all of the co.. The set CM-M CameraMount S3D consists of the gimbal CM-M-G3D in combination with the hand frame CM-M-HFR and is fitted with the following components. 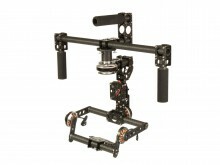 The set CM-M CameraMount S3D consists of the gimbal CM-M-G3D in combination with the hand .. The set CM-M CameraMount S3S consists of the gimbal CM-M-G3S in combination with the hand frame CM-M-HFR and is fitted with the following components. 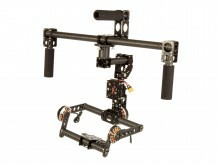 The set CM-M CameraMount S3S consists of the gimbal CM-M-G3S in combination with the hand .. The set CM-M CameraMount S2D consists of the gimbal CM-M-G2D in combination with the hand frame CM-M-HFR and is fitted with the following components. 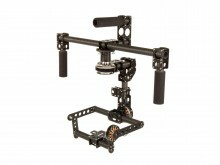 The set CM-M CameraMount S2D consists of the gimbal CM-M-G2D in combination with the hand .. The set CM-M CameraMount S2S consists of the gimbal CM-M-G2S in combination with the hand frame CM-M-HFR and is fitted with the following components. 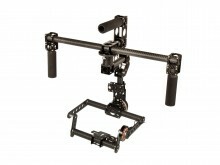 The set CM-M CameraMount S2S consists of the gimbal CM-M-G2S in combination with the hand .. The base frame is the central component of the quadrocopter AF4-350-3D. Since its motor axes distance is 350mm, propellers with a maximum diameter of 9.5” can be used. The frame consists of seven CNC-milled carbon plates of the highest quality that are connected by only 12 screws. This makes the copter extremely lightweight at only 120g (excluding the rubber elements that come with it) while maintaining highest possible stability. Two breadboards – 45 x 45mm and 30.5 x 30.5mm – also allow for the integration of mini control systems such as the NAZE32 by AbuseMark or the NanoWii by Flyduino. The centerplates are designed in such a way to minimize the overall weight through recesses while simultaneously leaving enough surface area to securely fasten the electrical components. An additional plate, mounted above the upper centerplate, increases stability even more and protects the valuable electronics against possible damage. Both the arms as well as all plates consist of CFRP pressed at high temperatures. This material provides for maximum solidity while remaining at an extremely low weight. This frame comes with a complete assembly kit. All screws and nuts are made of type A4 stainless steel. The nuts used here are exclusively so-called press nuts. Using special tools they are being molded into the CFRP-plates which allows for easy assembly without the use of screw wrenches or pliers. The lower centerplate already contains all of the press nuts that are necessary to assemble the components in all possible configurations. This frame was mainly designed for sophisticated acrobatic flights, including 3D mode, and will even be able to survive crashes at a very high velocity without parts being damaged. If an arm or a centerplate does happen to get damaged it is no problem to order a single replacement piece. We recommend that especially beginners or lesser experienced pilots opt to install the motor protection plates (AF4-350-3D-MPP) that can easily be removed again at any time. Four optionally mountable supporting feet (AF4-350-3D-LLG) are also part of the system and offer support during take off and landing. The plates are made of high-strength CFRP. 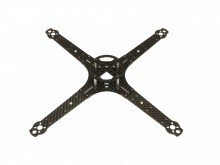 The base frame is the central component of the quadrocopter AF4-350-3D. Since its motor ax..